This resource identifies those who made significant contributions to the building and provides details of the structure’s classrooms, exhibits, and various other features, including its numerous tributes to the legacies of past and current ministers of the Gospel. 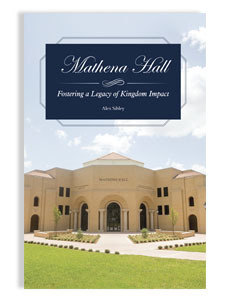 The hope is that Southwestern students will be trained for Gospel ministry within the walls of Mathena Hall, then go forth into the world to spread the message of Christ and advance God’s Kingdom, thus joining the legacies of the great men and women who came before them. Alex Sibley serves as managing editor of Seminary Hill Press and associate director of news and information at Southwestern Seminary. He graduated from Southwestern with his Master of Arts in Biblical Counseling in 2016.